Ode to Throne of Glass... and lifelong writer friends. By the time I got to the end, I had tears in my eyes, for a thousand reasons. The story is beautiful, so fully developed it’s easy to believe it has spent a decade evolving and changing. It’s the story of an assassin, of a prince and a captain of the Royal Guard, the story of a world so fully realized, so completely layered, I want to believe it exists. It’s rags to riches and back again, it’s ball gowns and sword fights, it’s love and loss. It’s so many things it’s nearly impossible to put to words. Sarah J. Maas, the author, started writing this book in her teens, on a site called Fictionpress—the same site where I once penned some utterly horrible books, starting when I was 20—which was in 2003. I can say without a doubt, if I had not stumbled upon that site, I would not be writing today. In 2008, five years after joining the site, I got my first book deal—a two book deal for Prada & Prejudice. I didn’t write for fictionpress any more, but I popped in on it occasionally, and I never forgot the then titled QUEEN OF GLASS. While I found modest success on the site (my most popular story has over 150,000 hits, with 600 or so reviews…), my success paled in comparison to Sarah’s. I am not sure if there is a ‘ranking’ system on the site, but it would be nearly impossible for any one to say they had a story more popular than hers. She’d left a note up months (years?) prior, that she was planning to revise QUEEN OF GLASS. And then she went mostly silent. I didn’t know Sarah. We’d never emailed, or IM’ed, or anything like that. But the story stuck with me, and I felt a certain camaraderie with this writer I’d never talked to, but who clearly took her writing as seriously as I did. Her talent shone through, and she deserved to find success. I just thought I'd drop you a line and see how everything is going in regards to revising QUEEN OF GLASS, and if you are pursuing publication. The reason I ask, is that I too, started on Fictionpress (in 2003) and got a book deal this year for my debut, PRADA AND PREJUDICE, from a major publisher. It's been a crazy journey from Fictionpress to publishland! Since QOG is one of the books I really love from FP ( I think you are insanely talented and creative!) I wanted to see if you had any questions about how I made the journey or just needed any help in general. It sounds kind of pompous when I read it now. I sound all, “Since I am so amazing and know everything, I thought I’d offer you my advice!” haha. I smiled, remembering how it felt when I got those first few rejections and though OMG I AM NOT GOOD ENOUGH. I told Sarah that three rejections was NOTHING – in big ol caps—telling her I knew plenty of successful authors that had 30, 40, 50 rejections…and then asked how long QOG was. It was… LONG. Although it would probably take me a few weeks to get through it, would you like me to read QOG and see where you can trim some? I’d be honored/thrilled to have you look at QoG, and please don’t hesitate to chop out extra junk. She attached the book that day, and based on our email chain, it looks like it took me two months to send back the book, during which time we didn’t talk at all. She probably thought I disappeared and she’d never hear from me again. I don’t remember how long I had the book before I opened it, but I remember sitting on the train every morning and every afternoon—thirty minutes each way—for a couple of weeks, totally engrossed in her world, her assassins, her beautiful, beautiful writing. At that time the book was 900+ pages long—247,000 words. I remember typing up that email, and feeling like I should write it while covering my face with one hand and looking at it through my fingers. Sarah and I had exchanged maybe 5 or 6 emails at this point, and I had no idea how she’d take my advice. I’d spent almost two weeks of my (little) free time, and I half thought she might smile politely, thank me, and then chuck everything. A lot of writers are so close to their precious manuscripts that they don’t take advice well, and I was no one to her. Just a random person who had emailed, volunteered to crit her novel, and then hacked it to pieces. To make a weird analogy, part of the reason why Jaws works so well as a scary movie is because we don't see the shark for most of it, and we're left to our imagination's worst fears. This was a girl who knew what she was talking about. And after struggling for three years to get my break, I am totally happy to do anything I can to help someone. You're the type of writer I'm willing to help-- the type of person who is taking it 100% seriously, who researches the industry, who writes almost every damn day, and who believes in her own work deep in her soul. That kind of passion deserves to make it. Sarah started querying the following month, after wading through all my notes and strike-throughs and gibberish, and a month later, an agent called and offered her representation. It sold later that year to Bloomsbury. Helping her gave me a big moment of clarity-- I wanted to do this for a job, not just as a friend and a writer. She's a big part of the reason I became an agent. And now, with THRONE OF GLASS coming out this August, I have to say—I think Sarah’s poised to be blurbing my novels any day now. Sarah, like I said above, you deserve to make it. And make it, you did. Congratulations on an amazing, amazing novel. 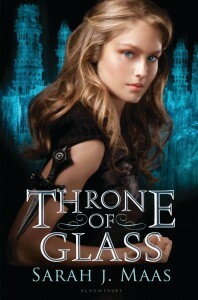 I could not be more proud to call you a friend, and I can’t wait until the world gets to read THRONE OF GLASS.